Published on Tuesday, November 20, 2012. This article appears in the December/January 2013 issue of American Craft Magazine. In a kitchen steamy with boiling lobsters, his grandson bangs wooden spoons on an overturned bowl. His granddaughter claps and sways. His daughter plucks chords on a guitar. And his wife calls out lyrics as friends gather around a table that flows from a trunk-like pedestal into a curving swath of glossy walnut. “You are my sunshine, my only sunshine,” croons the man who made the table, strumming his ukulele. Sunshine is an apt image for this artist, whose tables, chairs, chests, and clocks inhabit museums, galleries, public spaces, and private homes around the world. 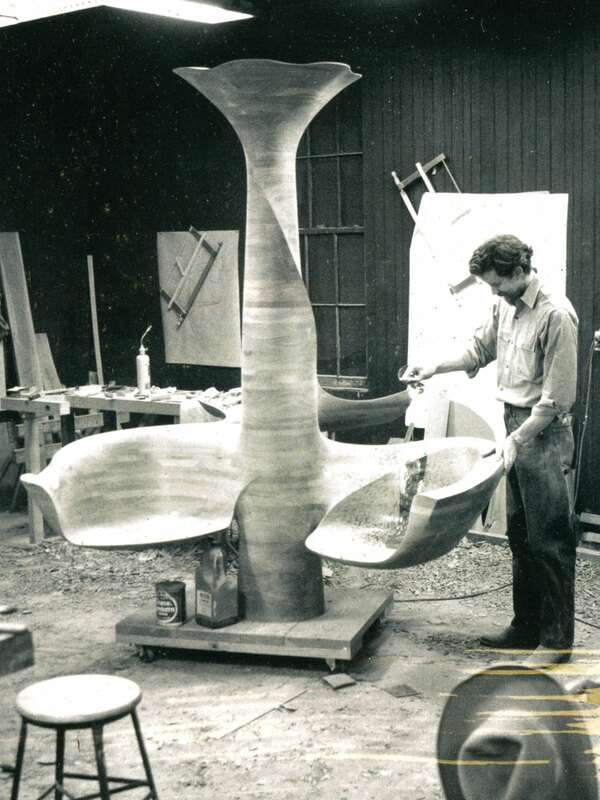 As he embarks on a yearlong celebration of his 80th birthday and 50-year career, Wendell Castle is virtually basking in spotlights – including solo shows of his recent and early work; a new catalogue of 1,700 of his artworks; his fourth honorary doctoral degree; and yet another lifetime achievement award. 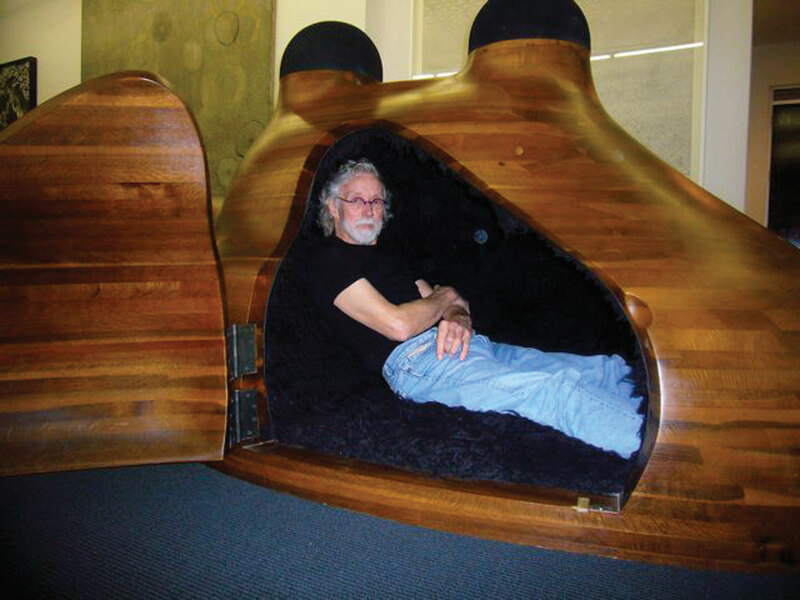 But perhaps just as enviable as Castle’s legacy as father of the art furniture movement is that he’s still going strong – and that he’s achieved all of this without sacrificing his personal life. 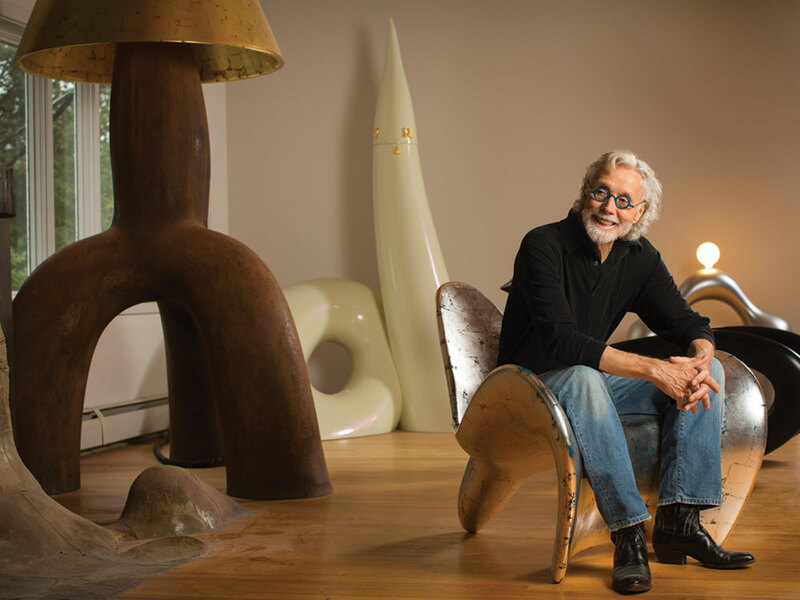 If his sculptural furniture buzz-sawed through the boundary between art and craft, his lifestyle similarly shatters stereotypes. Sawdust and planks notwithstanding, Castle fits neither the starving artist stereotype nor the self-indulgent celebrity one. 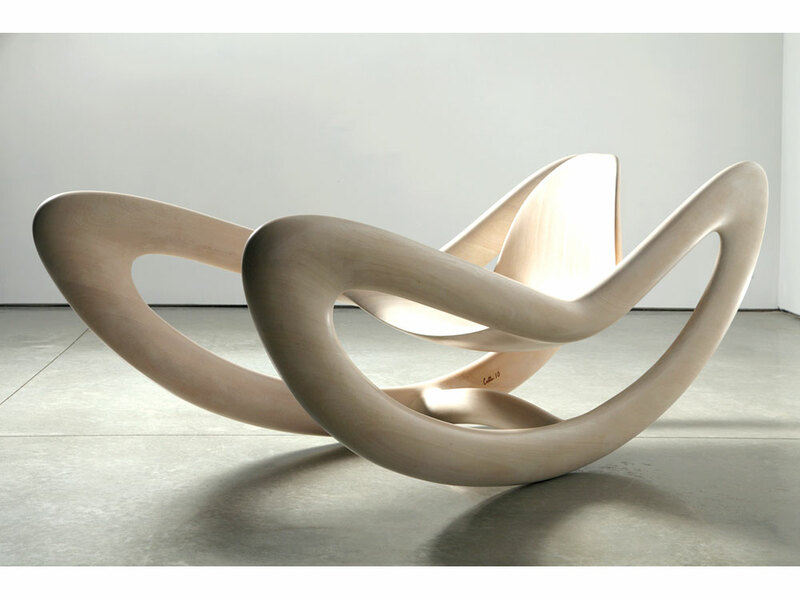 His life seems as playful and practical, as organic and firmly structured as his sculptural furniture. The grandson of Midwestern farmers who survived the Great Depression, Castle put down deep roots in upstate New York some 50 years ago and has thrived, even amid the Great Recession. He lives with his wife of 41 years, sculptor Nancy Jurs, on a 16-acre estate in Scottsville, in a sprawling 107-year-old compound that’s brimming with their own and others’ art, a collection of sports cars, and with visiting family, friends, and neighbors. But six days a week, Castle can be found several blocks away in his studio, where he and seven assistants create one-of-a-kind and limited-edition pieces priced between five and six figures. In nearby Le Roy, another team of craftspeople produce his classic designs in more affordable furniture for the Wendell Castle Collection, which he founded in 1998, and now sells through a dozen American showrooms. Castle also often drives seven miles north of his home to Rochester Institute of Technology, which hired him 50 years ago and where he is currently an artist-in-residence, giving lectures and demonstrations to students in the Industrial Arts school, as well as the School for American Crafts. 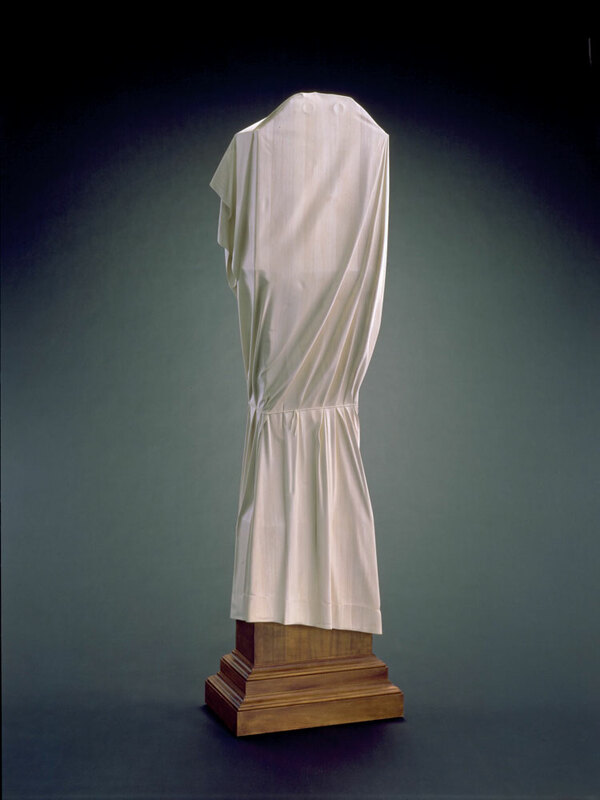 Seven miles farther north lies Rochester itself, where he regularly plays tennis at the Genesee Valley Club, attends meetings of the Pundit Club, and supports the Memorial Art Gallery, which has acquired 12 of his pieces and will unveil his cast-iron installation in its new sculpture garden this spring. Hazel eyes encircled by tangerine-colored spectacles, lean frame clad in designer jacket and jeans (often consignment-shop finds), feet shod in scarlet cowboy boots, Castle is usually the most fashionable man at any opening. And the least talkative. What also comes through, in speaking to family and friends, is Castle’s loyalty – how the artist puts people first. He’s the husband who, the morning after his wife’s retrospective opened in 2009 in the Everson Museum of Art in Syracuse, sat by the hotel pool painting her toenails a bright magenta. He’s the father who flew to Paris to install bookshelves in the apartment of his daughter, Alison Castle, 39, who has written several books about artists and filmmakers and is planning to make a documentary about her “enigma” of a father. 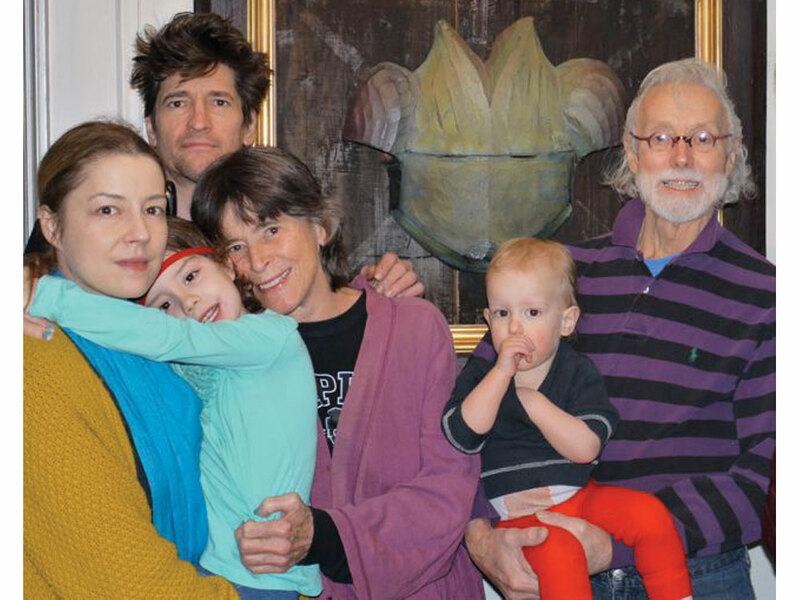 He’s the mentor who has launched the careers of dozens of designers and sculptors, including his stepson, Bryon Jurs, 50, who works in Castle’s studio. He’s the dog lover who, after a day of drawing and carving, makes time to chop chicken breasts to feed to Fozzie, the family’s elderly shih tzu. He’s the competitive tennis player who tore the rotator cuff and tendon of his right shoulder in mid-stroke, had surgery, and was back on the court six months later, practically running through walls to return shots. He’s the friend who lounges on his dock with this writer, watching his grandchildren – Arabella, 6, and Archibald, 3 – throw bread to koi swarming in the pond below. But those who know Castle also agree that nothing can come between him and his art, especially in recent years, when his focus has become, if anything, more intense. Sawdust coats every surface in Castle’s workshop, gathers in corners like snowdrifts, and fills the air with a sweet, buttery smell like popcorn. Regardless of size, material, or function, each new piece looks ready for takeoff. The forms are sleek, streamlined, and curved like nose cones or bullets or seed pods. Now, as ever, his ideas emerge as he draws with graphite on 100 percent rag paper – while trying to suspend all bias, value judgments, and practical considerations, such as how long a piece might take to make or how much it might weigh. “The purpose of a drawing is to generate ideas that become real things, not to make a beautiful drawing,” Castle says. “I have no use for computer renderings,” he continues. “The computer wants to iron out your lumps and bumps, and I don’t want them ironed out. I want it to still have some funkiness, not be too slick.” But he does embrace technology to help capture that quirkiness and conserve his time and energy. So after Castle renders the most promising drawings in three dimensions, carving maquettes out of urethane blocks, studio director Marvin Pallischeck sweeps them with a digital scanner, then prints out a series of blueprints for each successive layer of wood. 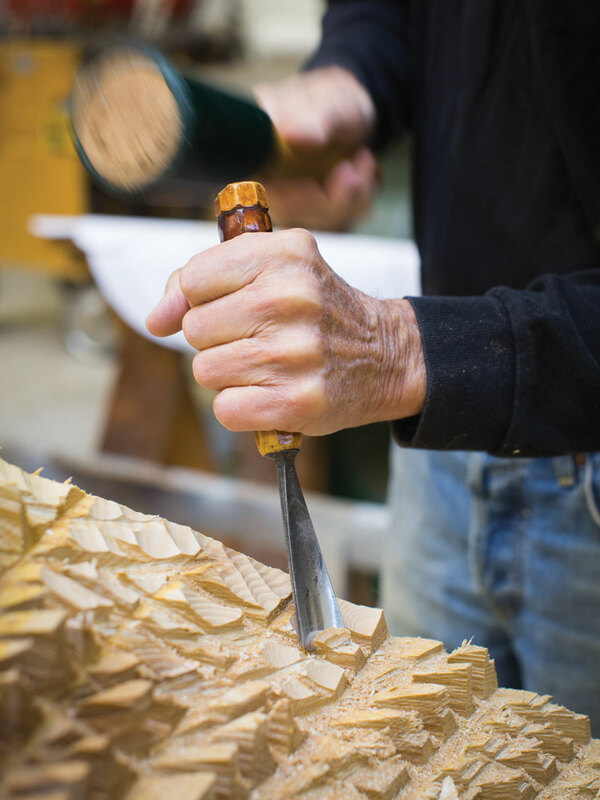 Once cut, those layers will be glued into a single solid form, then sanded, stained and finished – just like Castle’s original stack-lamination pieces. And so he does, until 4:30 p.m., when he drives off in his powder-blue convertible for his Monday tennis match in Rochester. 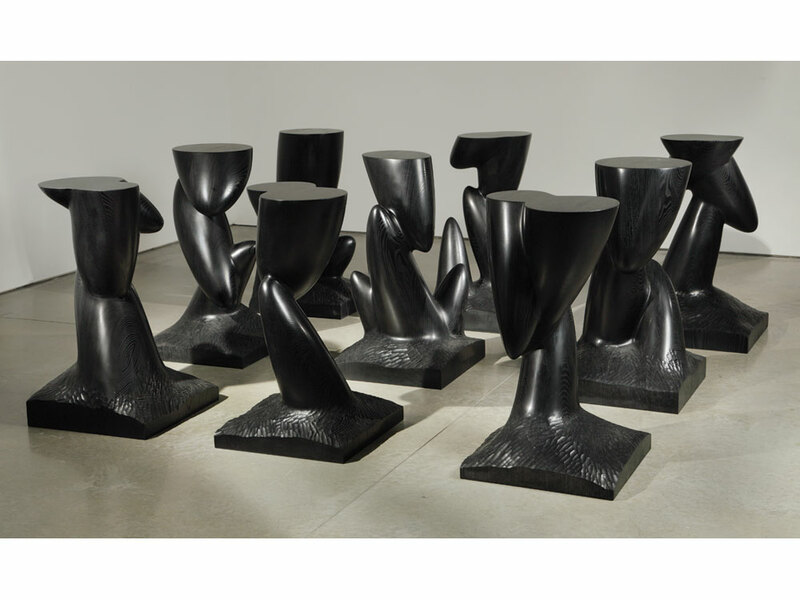 His latest one-of-a-kind and limited-edition furniture, including a grid of nine wooden tables with identical bases and varying tops, through January 26 at Barry Friedman Ltd. in New York. A two-story-high installation of stack-laminated pieces set in an iron base with a spiral staircase leading to a nestlike structure will open December 12 and run through January 26 at Friedman Benda gallery in New York. 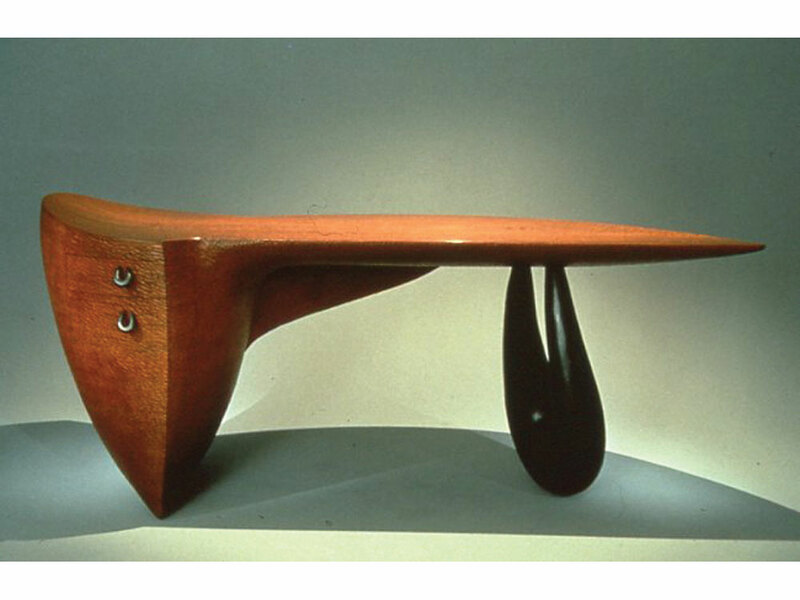 A show of early stack-laminated wood and fiberglass furniture, through February 20 at the Aldrich Contemporary Art Museum in Ridgefield, Connecticut. The museum co-published a book by the same name this fall. 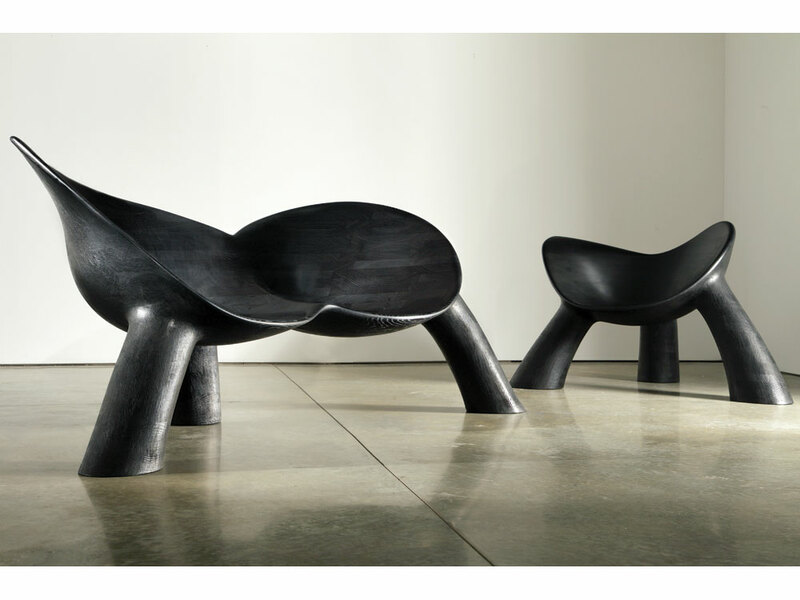 Furniture from the first years of the 21st century will be on display November 29 – February 4 at the Kentucky Museum of Art and Craft in Louisville. Some 1,700 works covering each phase of the legendary artist’s career are documented in this ambitious book, which will be published by The Artist Book Foundation this spring. 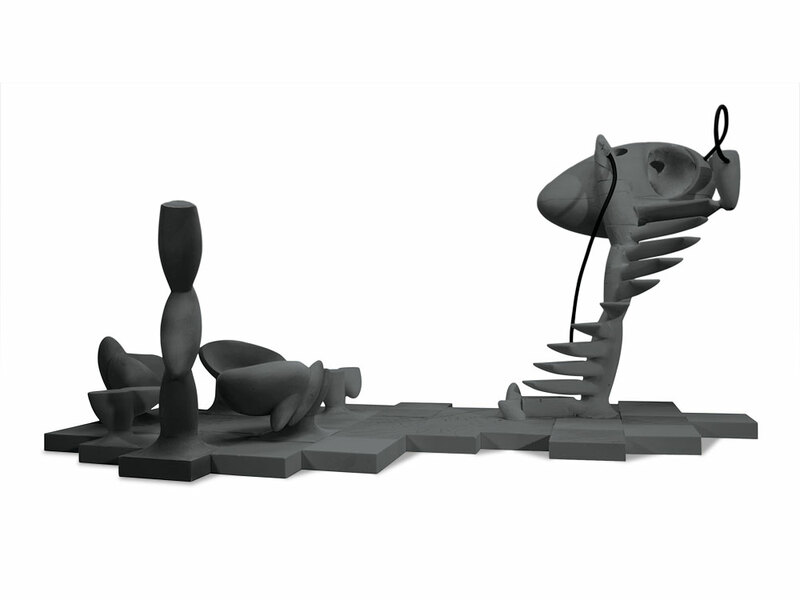 A table, chairs, and a 13-foot high LED lamp are part of this 1,000- pound cast-iron sculpture slated for the Centennial Sculpture Park of Rochester’s Memorial Art Gallery. A kind of outdoor living room, it will be unveiled this spring. Solo shows of his work will open at Carpenters Workshop Gallery in Paris early this year and at Seomi gallery in Seoul, South Korea, this summer. 1. Distrust what comes easily. 2. You have to stand for something or you’ll fall for anything. 3. Bring conflicting attitudes to bear on the same problem. 4. We should never know for whom you’re designing. 5. Always listen to the voice of eccentricity. 6. The whole secret to designing a chair is applying the seat of your pants to the seat of the chair. 7. The problem with taking life in your own hands is you have no one else to blame. 8. If your mind is not baffled, your mind is not fully employed. 9. Imagination, not reason, creates what is novel. 10. Jumping to conclusions is not exercise. 11. Keep knocking – eventually someone will look down to see who’s there. 1. If you are in love with an idea, you are no judge of its beauty or value. 7. If it’s offbeat or surprising it’s probably useful. 10. If you hit the bull’s-eye every time, the target is too near. Sebby Wilson Jacobson is a writer and editor in Rochester, New York. 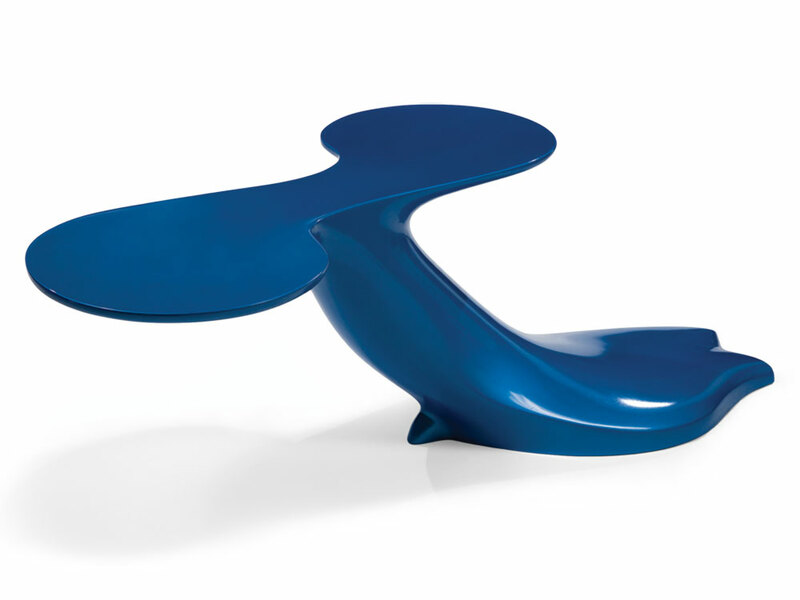 Wendell Castle built Two-Headed Table (1969) of gel-coated, fiberglass-reinforced plastic, capitalizing on material advances of the era. 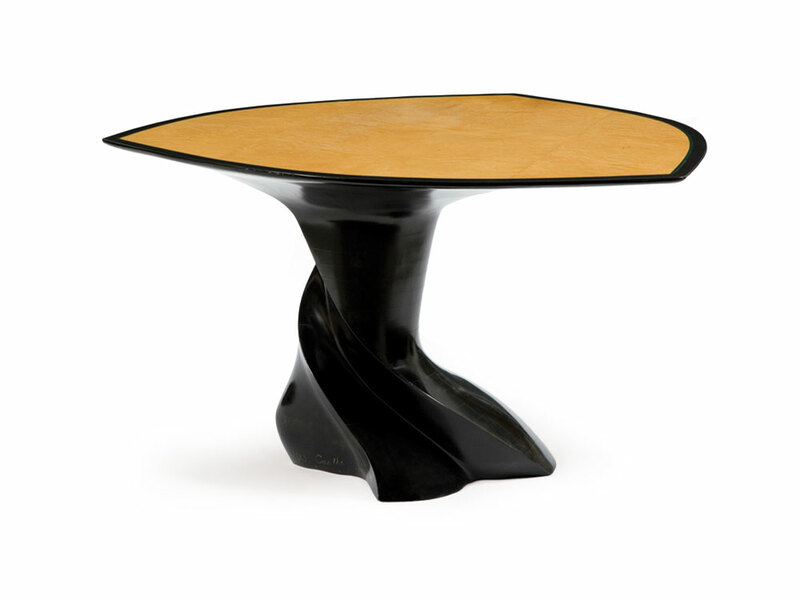 A Castle Dining Table (1978) pairs a handsome bird’s-eye maple top with an ebonized maple base. 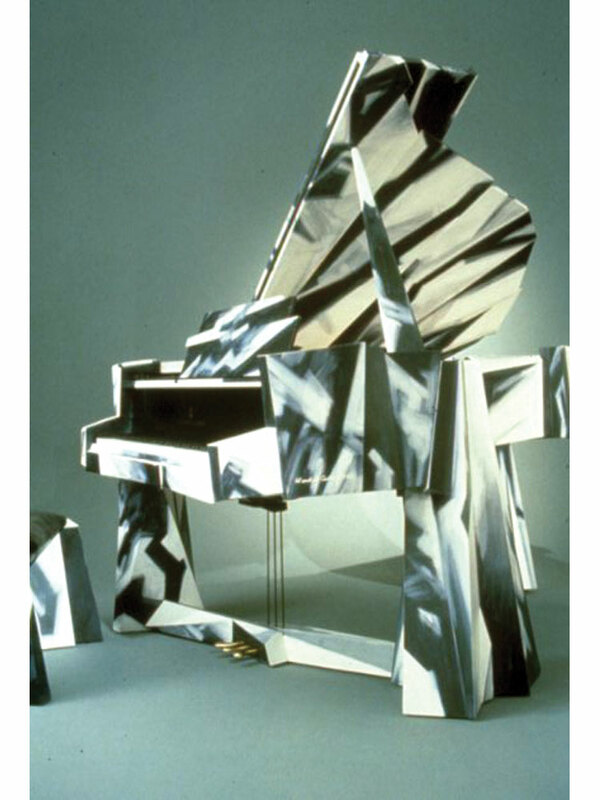 The Dr. Caligari Piano (1989-90), crafted from mahogany, mahogany veneer, poplar, gesso, aniline dye, acrylic paint, and velour. 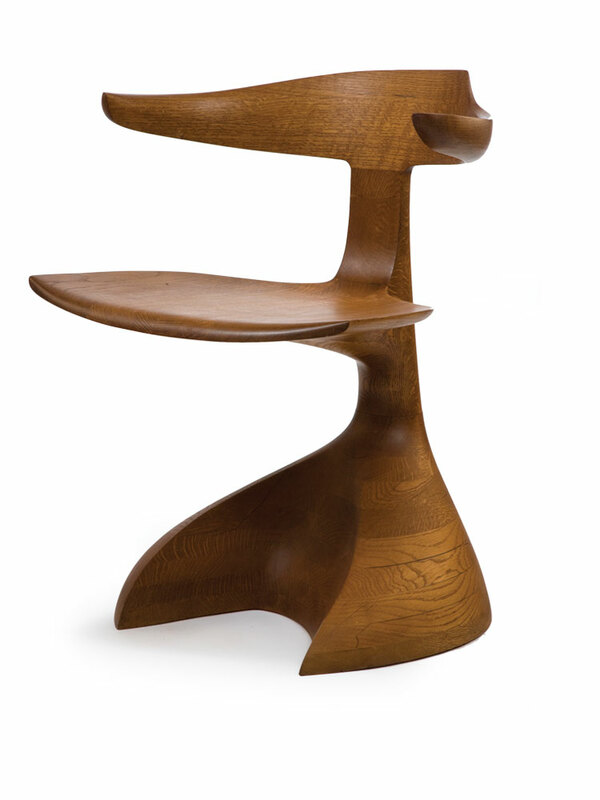 Wendell Castle’s classic Baker Dining Chair (1967), from a set of four made for a residence in Rochester, New York. 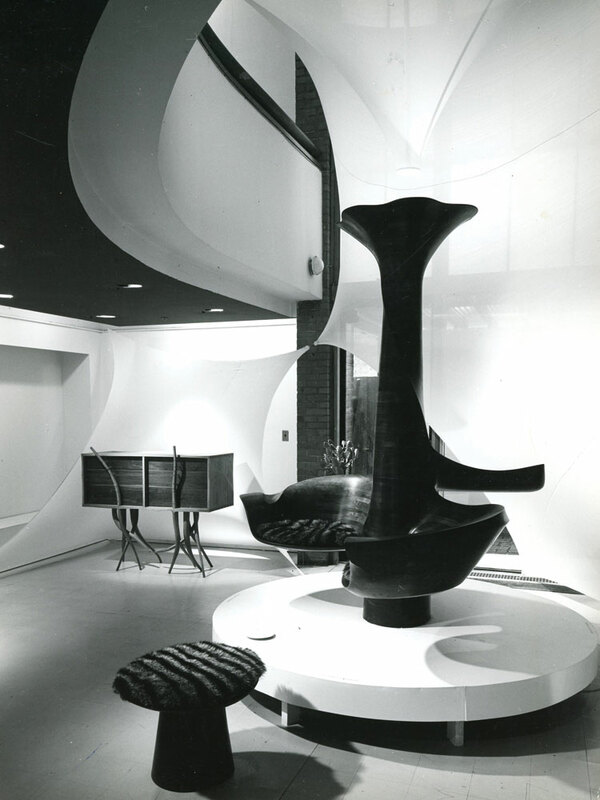 Castle’s favorite 1960s work, Library Sculpture (1965) sports raccoon fur cushions. 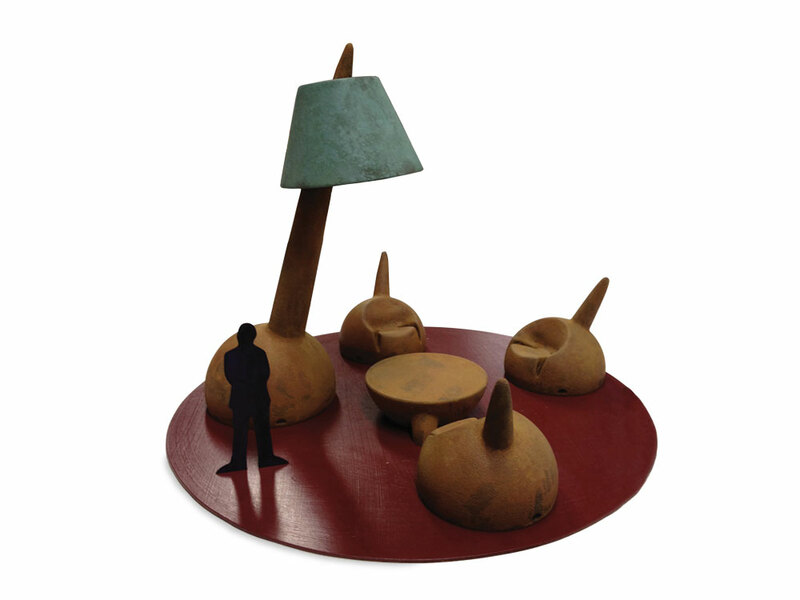 Castle’s favorite 1960s work, Library Sculpture (1965), was in a “Fantasy Furniture” exhibition in 1966. 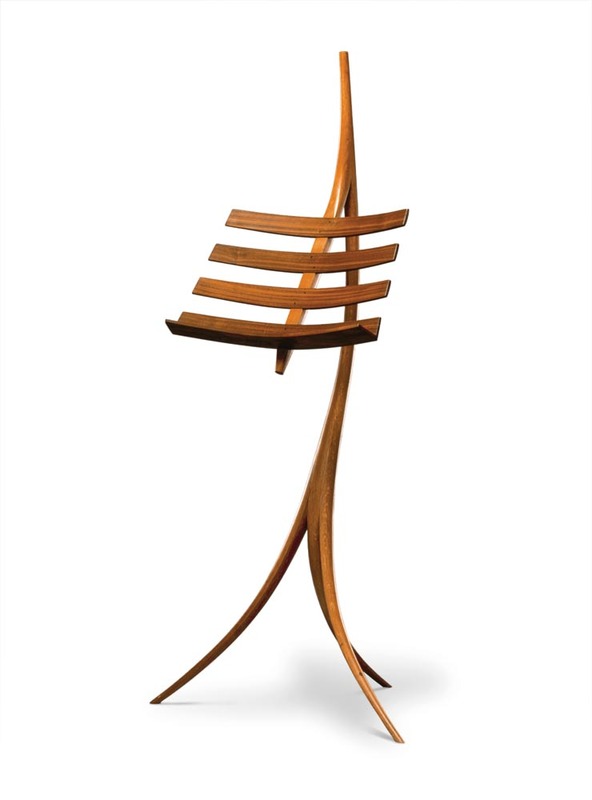 Wendell Castle; Music Rack, 1964; oak, rosewood; 4.6 x 2.1 x 1.7 ft.
Mirror (1975), measuring more than 2 feet high, is carved from stack-laminated walnut. The artist, pondering, in his 1969 Environment for Contemplation. Castle fine-tunes the shape of a recent stack-laminated creation with a rasp. 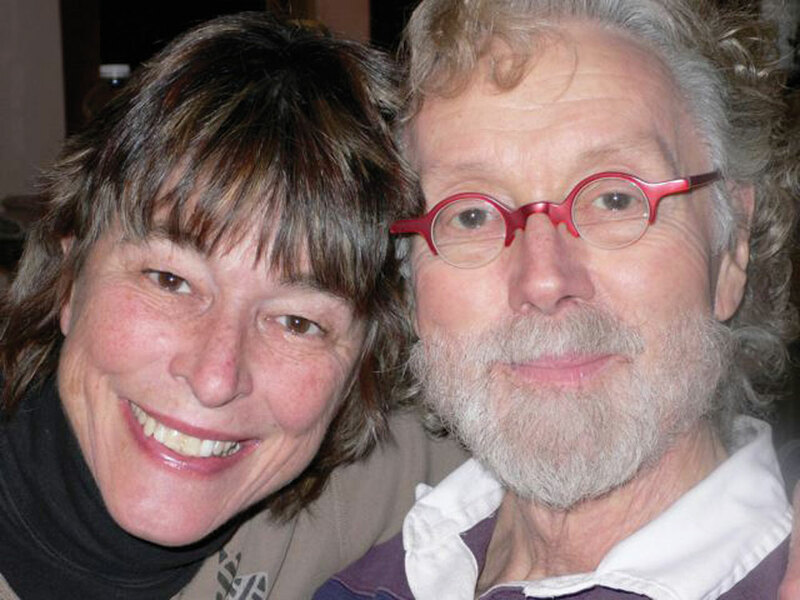 Castle and his wife, Nancy Jurs, also a renowned artist, working primarily in clay. 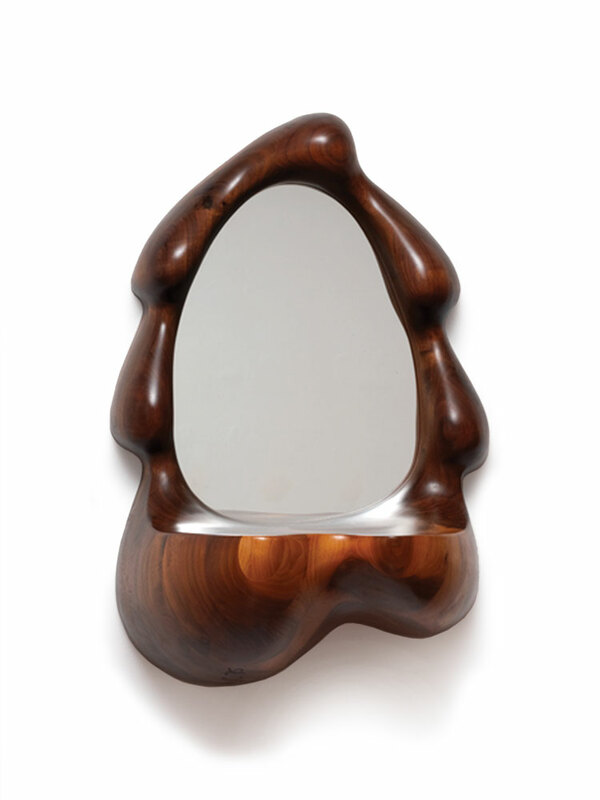 An Anxious Object #2 (1992), made of mahogany and mahogany veneer. 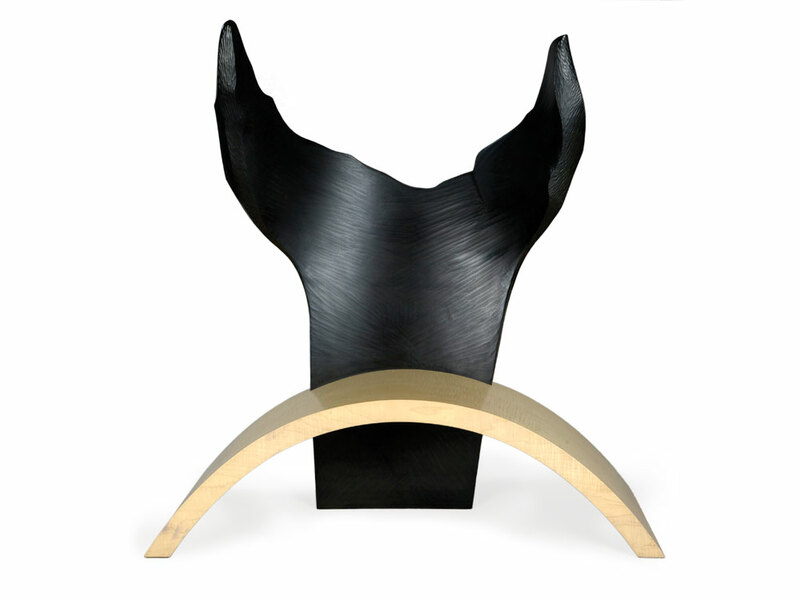 Dr. Caligari (1984), a clock, is the height of 1980s style, in curly cherry veneer, ebony, and gold-plated brass. 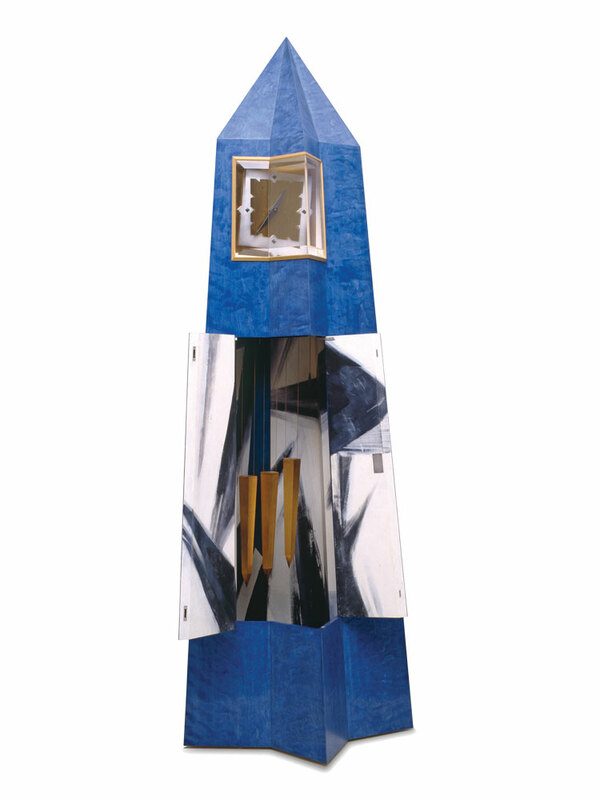 Ghost Clock (1985) is Castle’s favorite ’80s work, the pinnacle of his trompe l’oeil period. 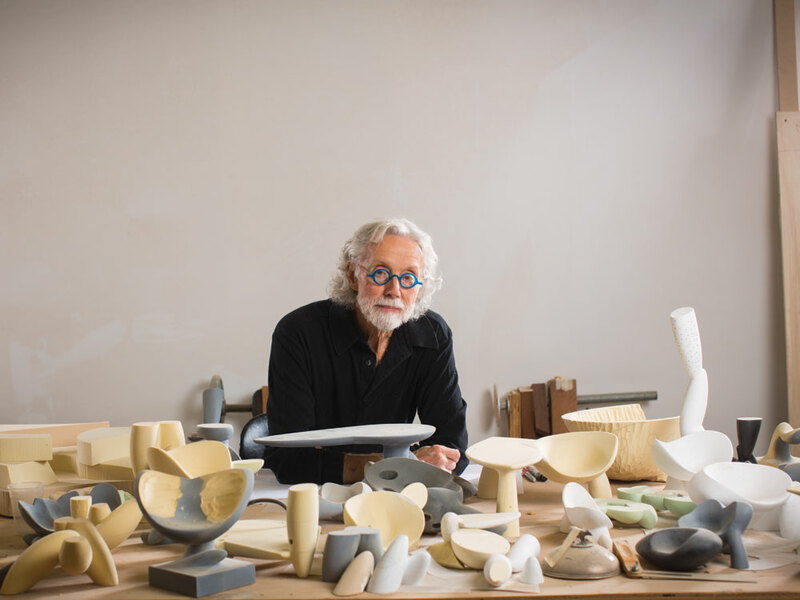 At 80, Castle still takes a hands-on role in making his pieces. Castle considers his striking Angel chairs the highlight of his ’90s work. He crafted Living Spirits (1990) of mahogany and curly maple. 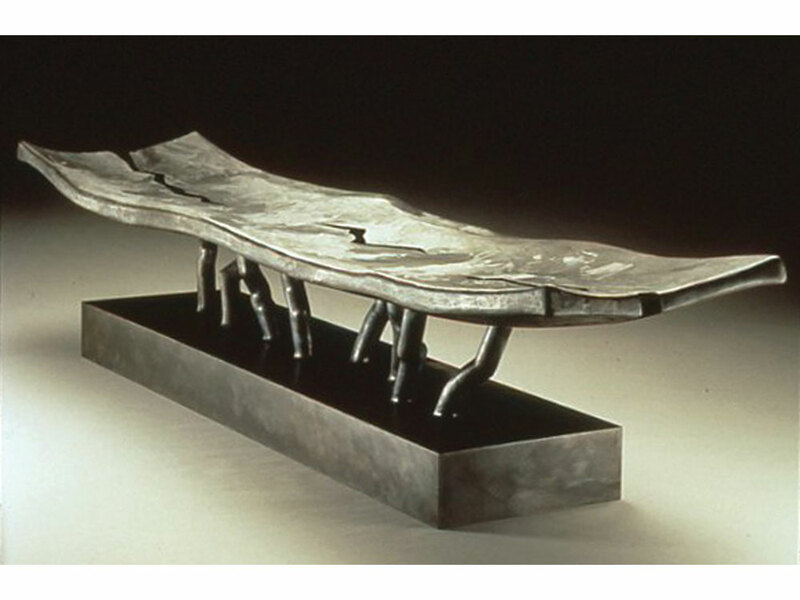 Castle’s bronze bench Broken Dreams (1993). The Castle-Jurs clan: Daughter Alison Castle and her two children, Bryon Jurs (Nancy’s son), and the happy grandparents. 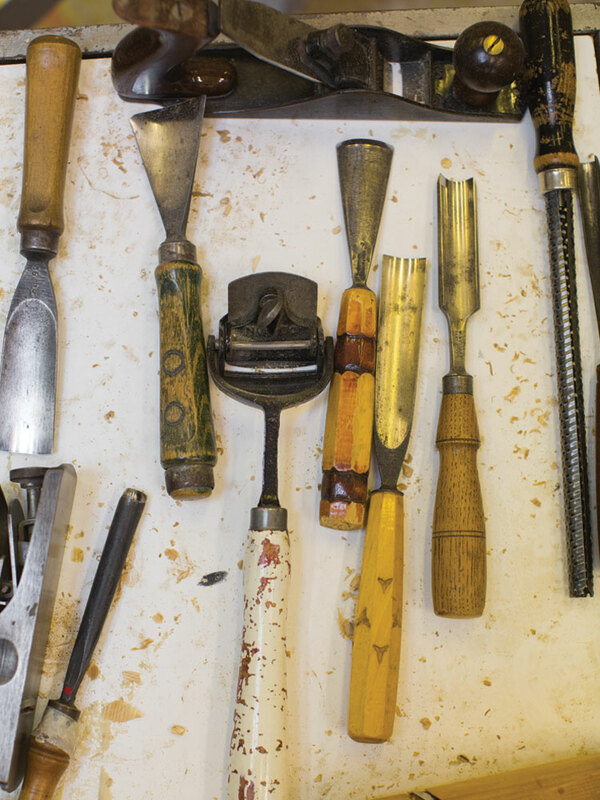 A collection of Castle’s well-worn hand tools. Courtesy of Barry Friedman Ltd. 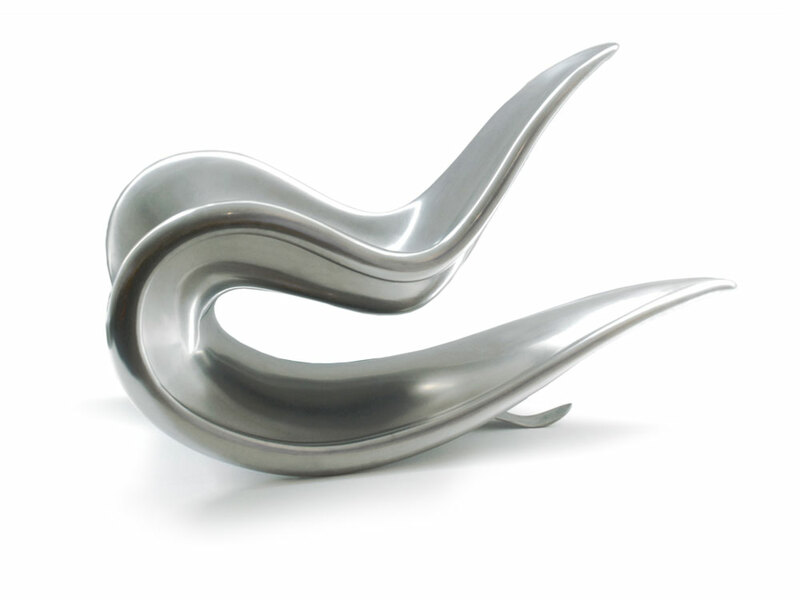 The brand-new Curious Paradox (2012), a collection of nine tables, is a highlight of Castle’s current show at Barry Friedman Ltd.
Abilene (2008), a rocker cast in stainless steel, is an edition of eight. What We Know (left) and What We Dream, both 2012, are both made of ash, an understated wood that lets form shine. 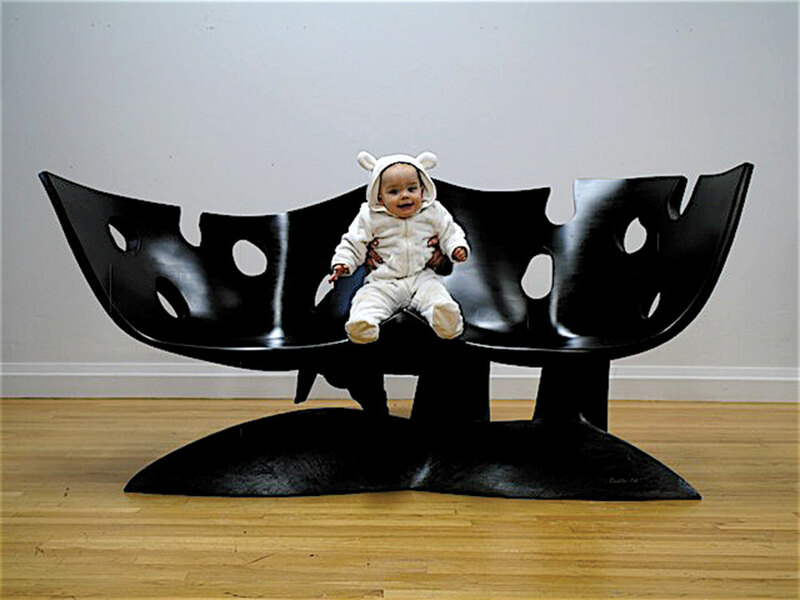 Castle’s granddaughter, Arabella, in 2006’s Shoot the Moon settee. 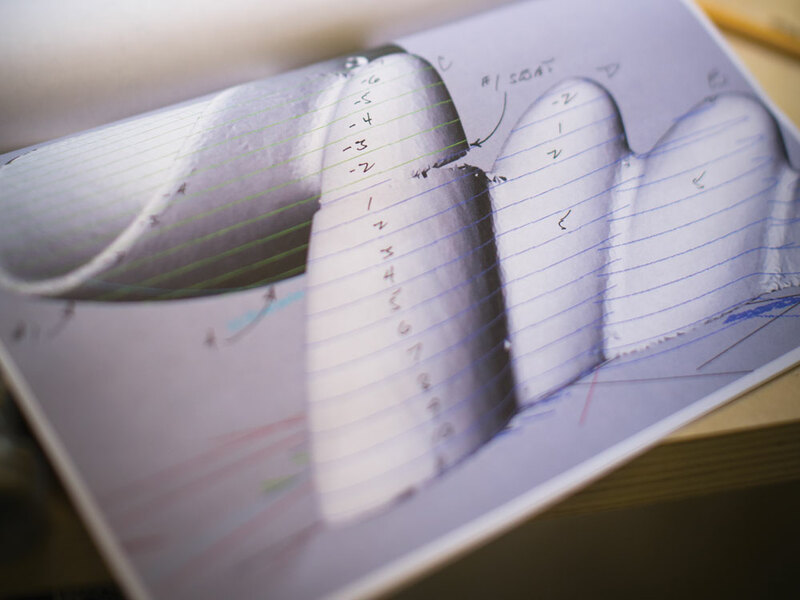 Castle begins each piece with a blueprint – made from a digitally scanned maquette – that breaks the work into layers. 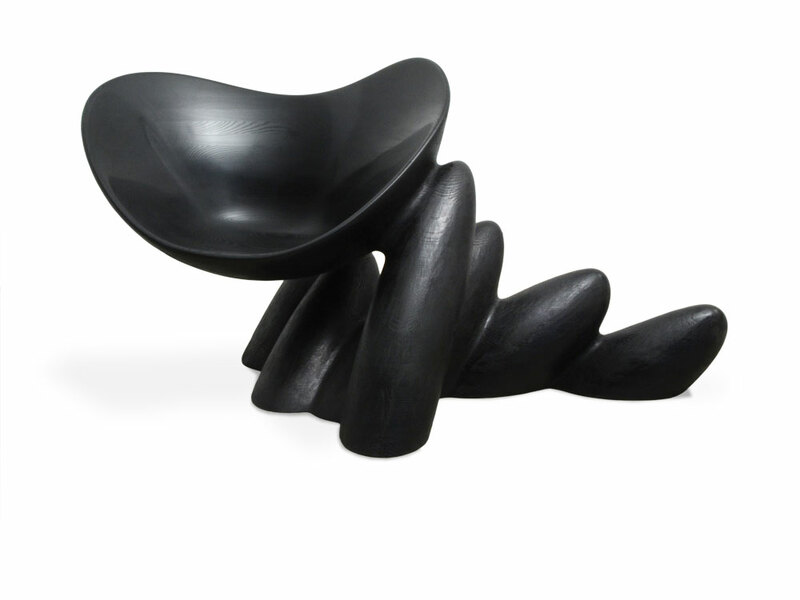 Dark Wish Chair (2012), measuring 5 feet wide, is made of ash and finished with oil. A scale model of the New Environment, an installation debuting at Friedman Benda gallery. 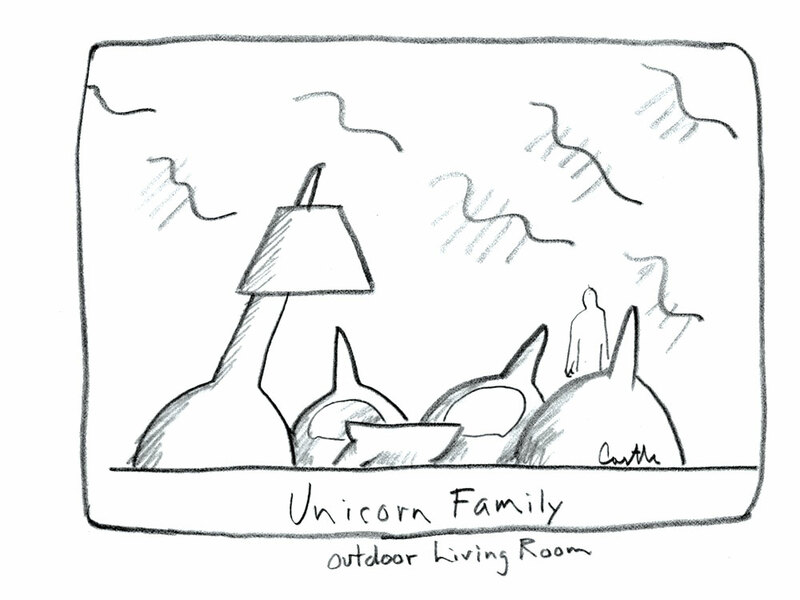 A sketch of The Unicorn Family, a huge cast-iron sculpture commissioned for Memorial Art Gallery’s Centennial Sculpture Park, to be unveiled next year. A model of The Unicorn Family, a huge cast-iron sculpture commissioned for Memorial Art Gallery’s Centennial Sculpture Park, to be unveiled next year. 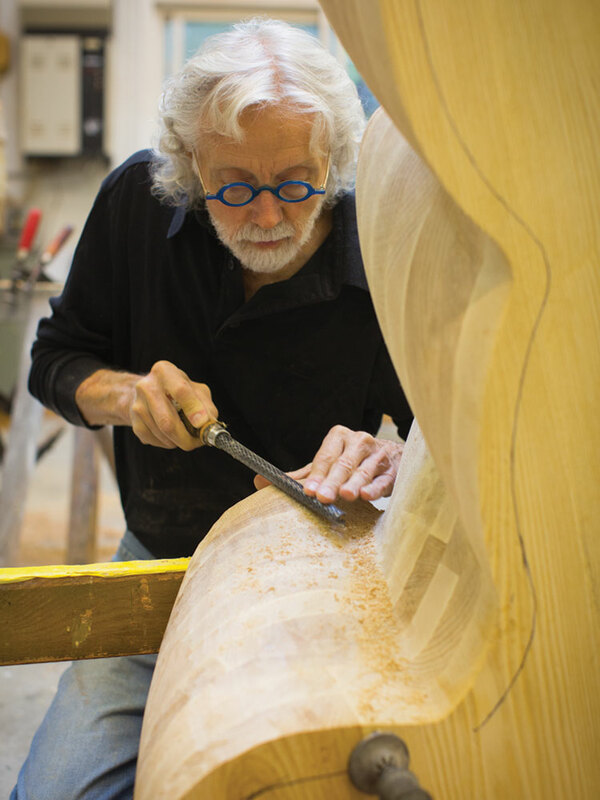 In a day spent with the legendary furniture maker and sculptor Wendell Castle at his work studio in Scottsville, New York, Laurie Manfra learns about his success as the result of a lifelong ambition to push the limits of materials, question the constraints of craftsmanship and defy the inclinations of the art and craft markets.